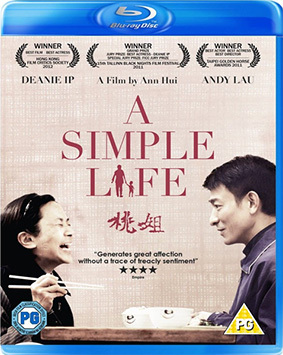 Ah Tao (Deanie Ip) has served a Hong Kong household for 40 years, and now that most of the family have emigrated to the US, she remains as the dutiful maid to Roger, the youngest son (Andy Lau), sharing his compact apartment. One day Roger comes home from work to find that Ah Tao has suffered a stroke. He rushes her to hospital, where she announces that she wants to retire and move to a nursing home. As the days go by, and Ah Toa's health starts to deteriorate, the tables are turned and Roger slowly transforms from the detached single man to the devoted carer of an elderly servant, as if she were his mother. A moving story of unsung heroism and everyday love and inspired by real events, A Simple Life (Tao jie) reunites Hong Kong superstar Andy Lau (House of the Flying Daggers) with his real-life godmother Deanie Ip. The film made a clean sweep in all the major categories at the 31st Hong Kong Film Awards, and has blazed an award-winning trail since its debut at the Venice Film Festival 2011, where Deanie Ip picked up the Best Actress Award. Described by The Observer as "A gentle, flawlessly observed picture, moving but never sentimental," and "A film that slowly but surely steals your heart" by the Daily Express, A Simple Life will be released on UK Blu-ray and DVD on 19th November 2012 by Arrow Films at the RRP of £19.99 for the Blu-ray and £17.99 for the DVD.